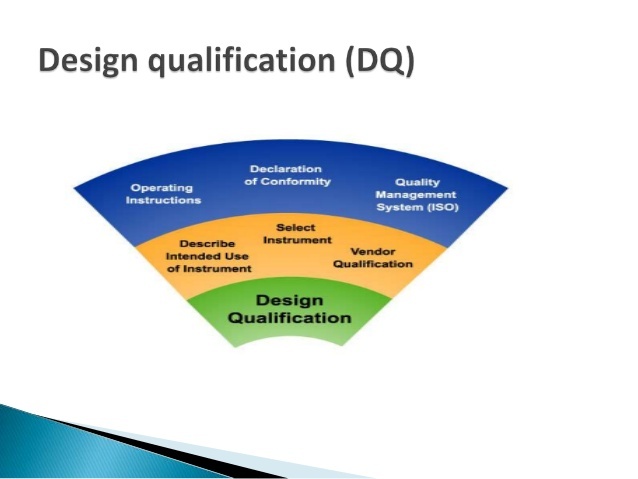 DQ abbreviated as Design Qualification, it is a common part of equipment qualification, it is the process of documenting design reviews to illustrate that all quality aspects have been considered at the design stage. 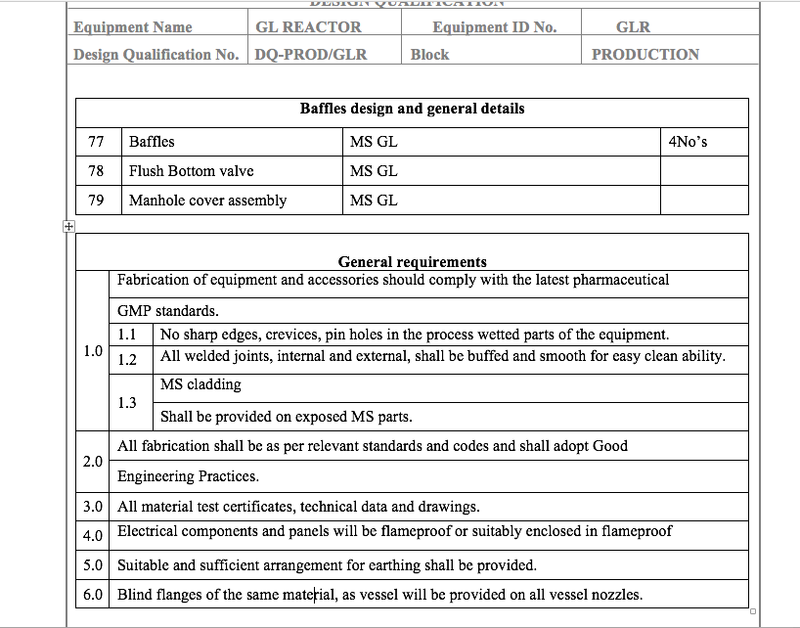 In other words, it defines the functional and operational specifications of the equipments. What is the Purpose of DQ ? The Main purpose of DQ is to ensure that all the requirements for the final systems have been clearly defined at the beginning. It should ensure that Equipments has all the necessary functions and performance. 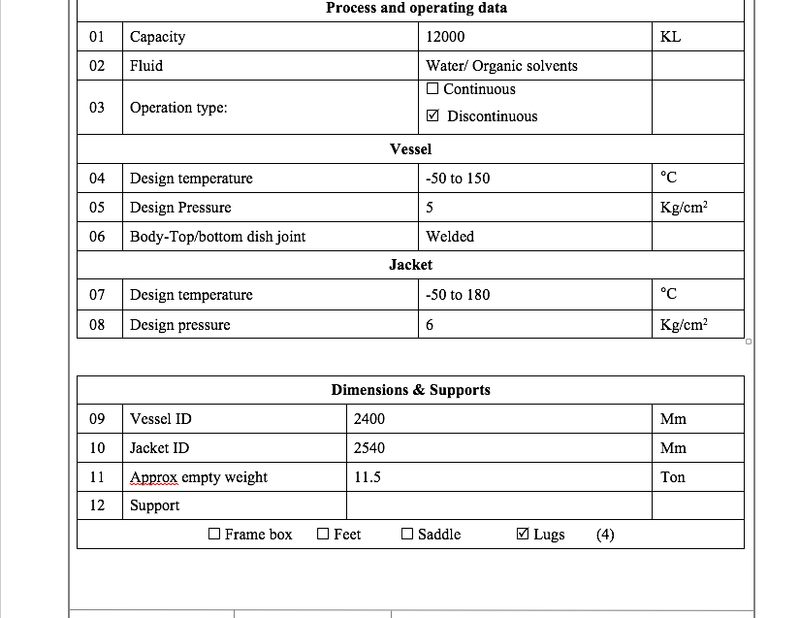 Process & Operating data: This includes Capacity, Operation type and fluid type. Vessel, Jacket, Dimensions and support : This includes the Design pressure, design temperature and the type of welding of the dishes. 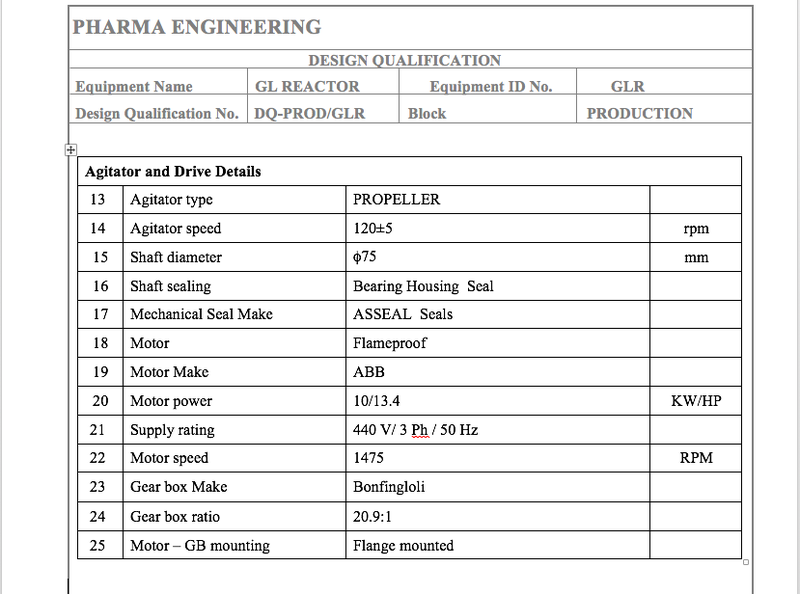 Agitator & Drive details : This majorly includes, Agitator type, Agitator dia, sweep dia, Motor, Motor make, Mechanical seal, Shaft dia, Motor power, Gearbox, Gear box ratio, Power Supply type, and Motor - Gear box mounting. Accessories & Fittings : We can consider this just like a checklist where we need to confirm the existence of the Accessories like guages, Rupture Disc, Safety relief valve, temperature Relief valve etc. 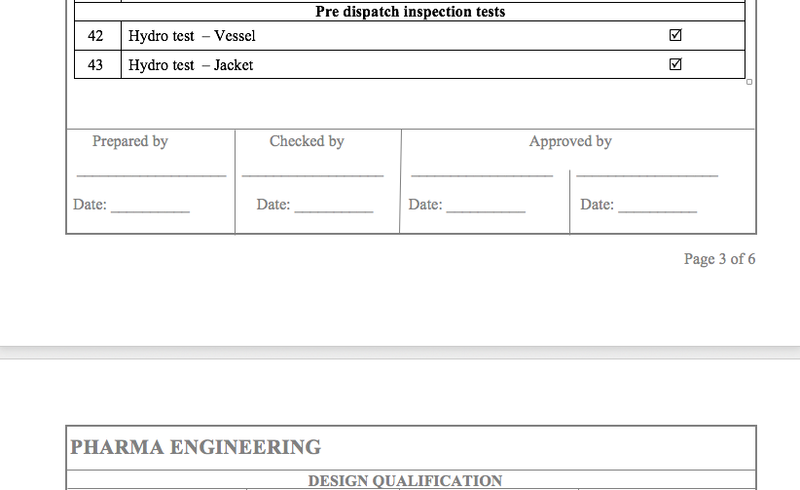 Pre-Dispatch Inspection Tests : This includes some tests like hydro tests, Vibration Test , Leak Test, Spark test. Vibration Test : This includes filling of our equipment with water upto 60% and starting the agitator, so that if any vibration found during the motion of the agitator. Leak Test : This will test for the leakages in vessel and as well as jacket. Spark Test : This is more common for GLR as if there is any break in the glass lining then it would be a safety issue, so it should be tested by a MS piece. Baffles Design and General Consideration : This includes about the structural support of baffles, their design and their MOC. 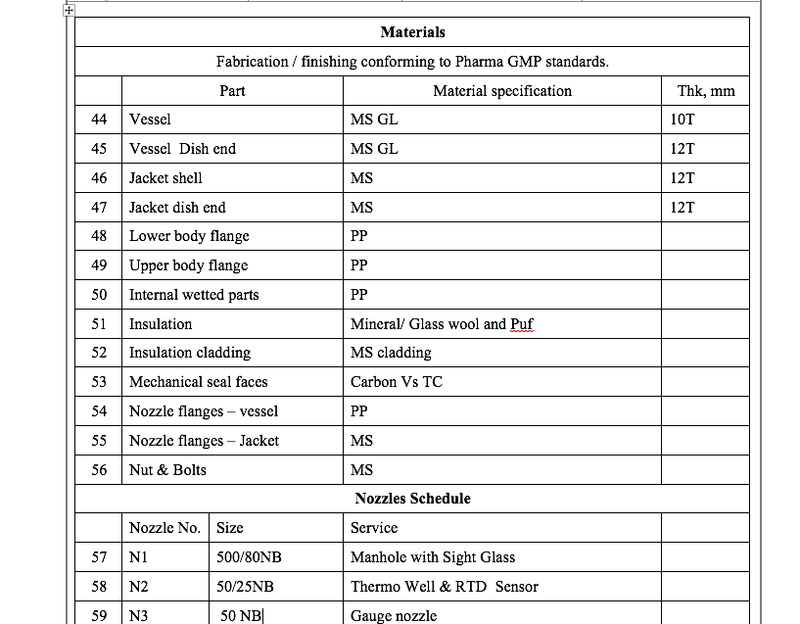 Materials Inspection : This includes the description of the various parts and their MOC details, and the Nozzle schedules ( Sizes in NB ). General Requirements : This includes the Fabrication details and the GMP standards, like the Equipment shouldn't have any sharp edges that leads to lack of operator safety while cleaning, electric lines assembly, and the finishing of equipment, Material Test Certificates. if you understand say cheers....!! 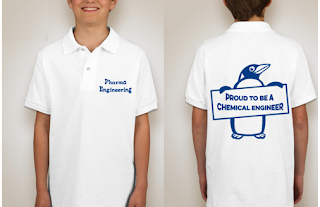 Any queries Please feel to contact us.......!!! You can get a Copy of this Format DQ, by requesting me through Contact Us Page.........!!! 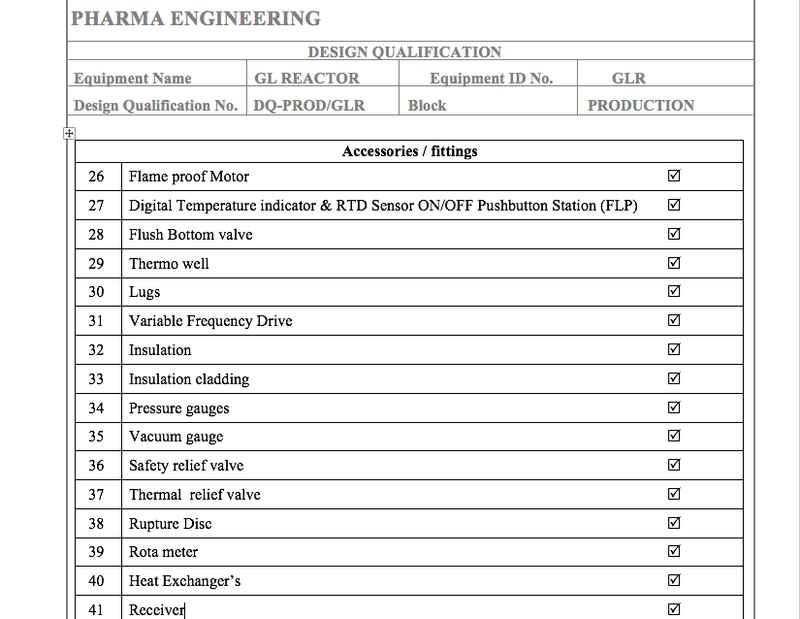 Note : This Document is the Self Developed Property of Pharma Engineering, any copies found on any site, A Strict Complaint will be filed on DMCA, which leads to penalty.